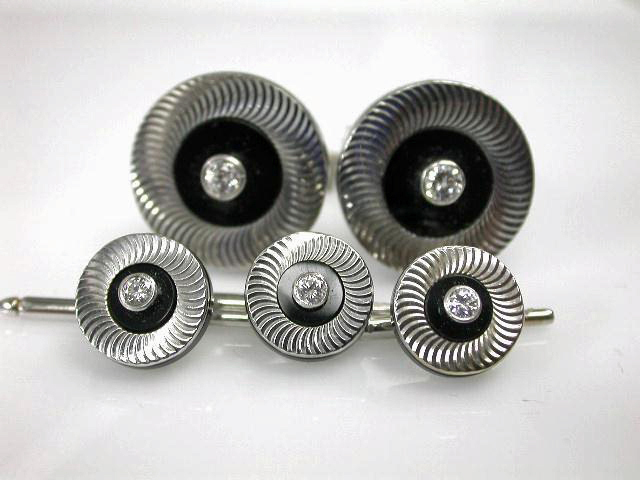 A striking vintage 14kt white gold dress set of swirl motif cufflinks and shirt studs, set on disks of onyx. The cufflinks have 2 round brilliant cut diamonds, est. 0.42ct (clarity:SI & G-H colour) and the shirt studs have 3 round brilliant cut diamonds, est. 0.21 (clarity: SI2-I1 & G-H colour). The cufflinks are approx. 20.22 x 4.02mm and the shirt studs 12.2 x 3.29mm.